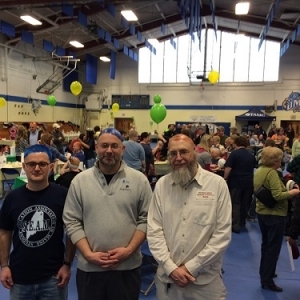 The University of Maine at Presque Isle and C-A-N-C-E-R [Caring Area Neighbors for Cancer Education and Recovery] are pleased to announce that the 10th Annual Planet Head Day, held on Feb. 20 in Wieden Gymnasium, raised nearly $20,000. 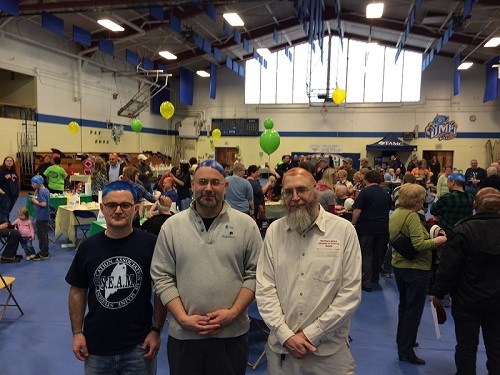 Nearly 50 County citizens had their heads shaved, while others donned bald caps, and had them painted to look like planets, moons, comets, and other celestial bodies during this unique fundraiser that brings together space science education and cancer awareness. The event has become one of the most widely known single-day fundraising events in northern Maine. Planet Head Day is the major fundraising event for C-A-N-C-E-R, an Aroostook County-based grassroots organization that assists cancer patients and their families. All monies raised during Planet Head Day stay in the County and help those recently diagnosed or in treatment for cancer. C-A-N-C-E-R strives to help patients with travel expenses and other treatment-related expenses. There was much to do and see at this year’s Planet Head Day. Community members from throughout Maine and nearby Canada stopped by the University to enjoy the afternoon of food, fun, and science and cancer education. As it has since the first year of the event, Pizza Hut provided free pizza. Water was available courtesy of Aroostook Trusses, and Carol Soucy baked and donated a birthday cake for the 86th anniversary of Pluto’s discovery. “This was the first Planet Head Day after the successful voyage of the New Horizons spacecraft past Pluto,” said Kevin McCartney, event-co-organizer with UMPI, whose head was painted as the dwarf planet Pluto for the tenth time. McCartney’s head had, for the past nine years, been painted by Jeanie McGowan, who was the original inspiration for Planet Head Day and is again fighting cancer. This year, McCartney’s head was painted by McGowan’s daughter Katie Maynard. Around the room, there was an assortment of displays related to C-A-N-C-E-R’s efforts and space education. Other organizations had displays that added to the festivities, such as TAMC’s Star Wars-themed booth, where kids could take a swing at Death Star pinatas with their very own “light sabre”. In one spot, a children’s art, game, and prize area was set up to provide fun activities for the younger attendees and, in another, the Knotty Knitters were providing free, hand-knit hats to all who shaved their heads. In the middle of the room, WAGM’s Katie Zarrilli and Michael Gudreau emceed this year’s event. Gudreau took on his emceeing duties after having his head shaved to become Earth. Off to one side, Lynwood Winslow took before and after photographs of each planethead so participants had a keepsake to take home. Off to another side, participants could enter for a chance to win a tableful of door prizes. There were more than 100 “planetheads” of all ages orbiting around the gym. A crowd gathered around a row of barber chairs to watch the brave get a free haircut—a very close shave—from several professional hair stylists, including Lisa Norton, Crystal McLaughlin and Myka Smith, along with returning stylists Amanda Durost and Donna Raymond from Great Beginnings Hair Boutique. Theatrical “bald” caps offered a less permanent option for participants. The resulting bald heads offered recognition and support for the many cancer patients who lose their hair during cancer treatment. At a nearby cluster of tables, volunteer artists and planet head painters were on hand to transform those blank canvases into the celestial body of each person’s choosing, employing imaginative painting techniques and even hand-crafted cardboard rings. Planet Head Day is one part of the University’s involvement in NASA’s New Horizons space mission to Pluto, a point of special significance as the space craft passed the dwarf planet last June and is now heading into the Kuiper Belt, where it should be visiting other objects in the future. Planet Head Day is held each year near the February 18th anniversary of the discovery of Pluto in 1930. The University’s Northern Maine Museum of Science has always sought imaginative ways to teach science and developed the program to combine science and cancer education into a single package. Sponsors for this year’s event include WAGM, Pizza Hut, and NAPA, in cooperation with Clukey’s Auto Parts. A video of this year’s Planet Head Day activities, provided by Kevin Blood, will be made available on youtube. Even though Planet Head Day is over, you can still make a donation to C-A-N-C-E-R. Donations can be sent directly to C-A-N-C-E-R, P.O. Box 811, Presque Isle, ME 04769, or call Louise Cardone-Calabrese at 764-0766. To view the video about this year’s event by David Deschene/Fort Fairfield Journal, click here.